Reported the Gulf Daily News today: "Mobs stoned trains and jammed roads with burning tyres in the eastern Bihar state, trying to enforce a day-long shutdown. "Shops, offices and schools remained closed yesterday, when official data showed that food prices in Asia's third-largest economy rose an annual 17.4 per cent in mid-January. 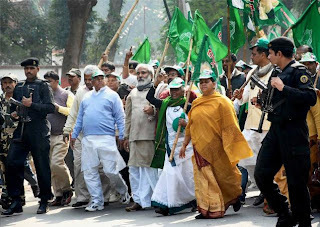 "At least 12 passengers were injured when angry crowds stoned a train in Hajipur town, while thousands marched in the street in different parts of the state asking shops to close." Added The Times of India: "According to reports, police fired in the air to disperse a crowd that had blocked a road at Dhangarha in East Champaran district. Bandh supporters also stoned vehicles at some places, police said. " Food prices have soared because last year's monsoon rains, which irrigate 60pc of Indian farms, were the worst in 37 years. Higher prices paid by government agencies to buy grains from farmers also helped push the inflation rate to 7.31pc in December, the highest in a year. ANARCHISTS in the UK are gearing up for a big campaign against the general election to be held this year. Said a report on A-Infos: "A packed meeting in London Sunday 24 saw Anarchist groups from London, Leeds, Halifax, Bristol, Hereford, Norwich, Cambridge, Brighton and Southampton plus individuals from Freedom Press,Liberty and Solidarity, IWW, Anarchist Federation, Antifa,Camden Anarchists,Croydon Anarchists and Whitechapel Anarchists come together to discuss a General Election Campaign. 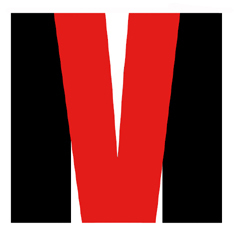 "A unanimous YES ws given to the idea of a consistent and coherent Anarchist intervention which will begin on March 31st with a rally in Trafalgar Square to celebrate the 20th anniversary of the Poll Tax riot and ask the question ‘Which is more effective – the Ballot Box or Direct Action’. 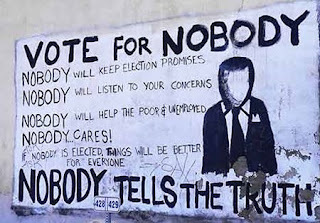 "A whole number of other surprises and interventions are planned and in the month of the actual election campaign the ANARCHIST WAR CABINET will meet twice weekly to plan actions and then daily for the last week till May 6th. "Freedom Bookshop will act as the hub for information coming in and out at short notice. This promises to be an exciting couple of months and a follow up meeting is scheduled for February 28th, in a world of growing centralism, alienation and marginalisation – combined with dwindling localism and community spirit – mutual aid itself is a revolutionary act. "In fact mutual aid is probably the most powerful weapon we have, as has been said time and again, a CW conference in London is just another political meeting – do it up north and it’s a major event!" IRAQI resistance fighters today struck a massive symbolic blow against the US-led occupation of their country. Four landmark Baghdad hotels, used by westerners, were heavily damaged by car bombs this afternoon in a co-ordinated attack. Reported The Guardian: "Security officials said at least 36 people were killed and more than 80 injured by attackers including suicide bombers and gunmen. "The first bomb was detonated between the Sheraton and Palestine hotels in the centre of the capital, causing massive damage to both well-known structures. 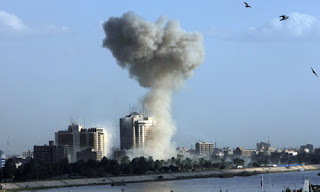 "Around three minutes later, the Babylon hotel on the banks of the Tigris river, just south of the US embassy, was hit by a suicide bomber driving a car past the perimeter barriers. Damage was also reported to be severe. "The final - and most audacious - attack came just two minutes later when gunmen opened fire on guards manning the gates to the Hamra hotel, which had been home to many foreign reporters since early 2005. "In the ensuing firefight, Kurdish peshmerga soldiers, guarding the border of the presidential neighbourhood directly across the street, engaged with an unknown number of insurgents. "Guards from the Hamra, employed by a British security firm, also opened fire. As they took defensive positions behind blast walls further inside the Hamra perimeter, a white van with a flashing red light to resemble an emergency vehicle broke through the hotel's security barriers and exploded inside the compound. "The lower levels of the Hamra were destroyed, with the blast taking place about 30 metres from the lobby." The blasts took place around the same time as the showcase execution of Saddam Hussein henchman Aki Hassan al-Majid and the BBC and other western media continued to gloat over the hanging of a man guilty of similar war crimes to their own leaders, despite the stark evidence that, seven years on, the war to control Iraq is still far from over. A FRENCH town erupted into riots after the death of a youngster whose scooter had allegedly been forced off the road by police. Residents of Woippy, a suburb of Metz in the east of the country, were not swallowing the official line that the 'accident' was in no way the fault of the cops and after a 200-strong silent protest, it all kicked off. 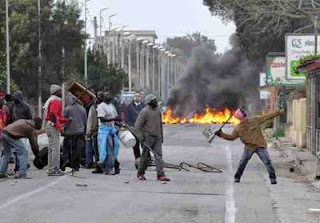 Said one report: "Youths set cars, trucks and a bus on fire, Deputy Mayor Jean-Marc Rosier told Reuters. They also smashed phone booths, while riot police responded by firing stun grenades, footage from M6 television network showed." TENSIONS are again running high in Greece with the start of the trial of the policeman accused of murdering 15-year-old Alexis Grigoropoulos. Ringed by riot police and an anarchist demonstration, the court today postponed the case until Friday, reported AFP. The trial has been moved out of Athens to the small town of Amfissa for security purposes. Around 200 anarchists marched through the centre of Amfissa today, chanting anti-police slogans and demanding that the process be held in the capital. Cop Epaminondas Korkoneas, 38, (pictured) is on trial for voluntary homicide, while his partner Vassilis Saraliotis, 32, is accused of complicity. One resistance group has threatened to kill Korkoneas, prompting authorities to send more than 400 police to Amfissa, which is 200 kilometres (125 miles) northwest of Athens. Reported Greek English-language paper Kathimerini: "An extra 700 police officers will be on duty in the town of Amfissa. "Police have also set up checkpoints on the three roads that lead into the town, located some 200 kilometers north of Athens, amid fears that anarchists or even urban guerrillas might try to disrupt proceedings. "Officers from Athens, as well as members of the anti-terrorist squad, have been in Amfissa since last week preparing the security measures. "A number of businesses in Amfissa have adopted extra security measures, such as installing metal window blinds." That is the view of a French government minister, who said the UN would have to clarify the Americans' role on the island. 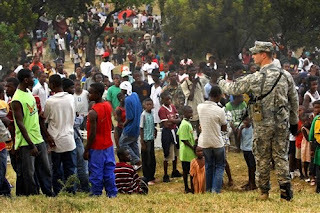 Reported The Times: "Thousands of American soldiers have poured in to Port-au-Prince airport since President Obama announced that he was ordering a 'swift and aggressive' campaign to help millions of Haitians left homeless by last week's 7.0 magnitude earthquake. "Six days after the quake, however, precious little aid is getting beyond the airport perimeters - largely because of security concerns - and aid agencies with long experience of operating in disaster zones have complained that their flights in are being blocked unnecessarily. "Among the aircraft turned back by American air traffic controllers who have assumed control at Port-au-Prince airport was a French government Airbus carrying a field hospital. "The plane was able to land the following day but the decision to turn it back prompted an official complaint from Alain Joyandet, the French Minister for Co-operation who is overseeing the French aid effort. "Speaking to Europe 1 radio from an EU ministerial meeting in Brussels this morning, Mr Joyandet said that the UN would have to clarify the role of the US in the Haitian aid effort. 'It's a matter of helping Haiti, not occupying Haiti,' he said. Venezuelan president Hugh Chavez has also criticised US 'humanitarian' efforts in Haiti, reported the Press Association. "It appears the gringos are militarily occupying Haiti," Mr Chavez said. "Obama, send medicine, doctors and water - not more soldiers." 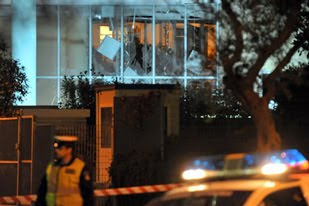 GREEK insurgents have exploded a bomb outside Greece's press ministry building, causing property damage but no injuries. Reported Al Jazeera: "The bomb went off outside the government building in the capital Athens late on Friday, just after private television stations Alter and Antenna had received anonymous warnings that an explosion was imminent." It said police reported there had been an anonymous warning call to two TV stations and a newspaper 15 minutes before the device went off. Added the website: "The explosion, which shattered windows, is the second one in Greece in less than a week. "Leftist and anarchist groups have mounted a series of attacks against police, business and public institutions since the police killing of a teenager triggered Greece's worst riots in decades in December of 2008. "Conspiracy of Fire Nuclei, a far-left group, claimed responsibility for a similar incident targeting the parliament on January 10, which also only caused minor damage. "The group also claimed a bombing that caused extensive damage to the ground floor of Greece's largest insurance company, Ethniki Asfalistiki, on December 27. 'We aim to cause material damage and we point out to the police that is should evacuate areas in a timely fashion,' a text claiming the insurance building attack on behalf of the outfit said at the time. "Another group, Revolutionary Struggle (EA), has been active for the last six years and is blacklisted by the European Union as a terrorist organisation. "EA claimed an attack on the Athens stock exchange in September, which caused no injuries. In 2007 the group fired a rocket at the US embassy without hurting anyone." IN ANOTHER sign that the USA's global empire is on the wane, Japan has stopped refuelling American warships. Reports PressTV today: "Japan's Democratic party-led government in an unprecedented decision has ended its nearly a decade-long refueling mission of the US-led forces in Afghanistan. "Incoming reports say Defense Minister Tishimi Kitazawar ordered all naval ships and their hundreds of personnel to return home after nine years of helping supply oil to vessels used by foreign forces that are engaged in a controversial war in landlocked Afghanistan. "Kitazawar is also expected to issue an official order that will totally terminate refueling operation in the Indian Ocean on Friday. 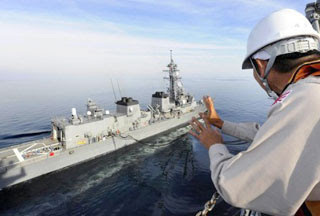 Japan's Maritime Self-Defense Force has been refueling the US mission since the Afghan war began in 2001. "Reports say Japanese ships have provided more than 500,000 liters of oil to vessels from 12 countries, including the US, France, Britain and Pakistan since last December. A defense ministry tally shows the fuel cost has gone above 26 million dollars. "Japan has promised to change the old way things worked between Tokyo and Washington. The new Japanese government, which is against a military solution for the conflict, has pledged up to five billion dollars in civilian aid to Afghanistan. "In addition, Tokyo's relations with Washington have been strained over a number of issues since Japanese Prime Minister Yukio Hatoyama took office last year. "Diplomatic ties between Japan and the US have recently witnessed a low over a previously signed deal to relocate an American base on Okinawa. The premier has suggested that the US military bases should be moved off the island of Okinawa or even outside of Japan altogether." The rebellion was sparked by a racist attack but reflects the horrific conditions and poverty in which these modern-day slaves are forced to subsist. 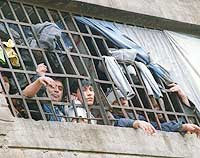 The Press Association reported at least 37 wounded, including 18 police officers in the Rosarno revolt. Added The Independent: "In one of the worst-ever incidents of racial unrest in Italy, the violence broke out on Thursday evening after white youths in a car fired air rifles at a group of immigrants returning from working on farms. "In a furious reaction, immigrant farm labourers fought pitched battles with police that lasted into the early hours. Dozens of cars were smashed with bricks and bars and the driver and passengers in one vehicle injured. "Yesterday, more than 2,000 Africans massed in the town centre to demonstrate against the shootings and their living and working conditions. Some chanted 'we are not animals' and others carried placards saying: 'Italians here are racist'. 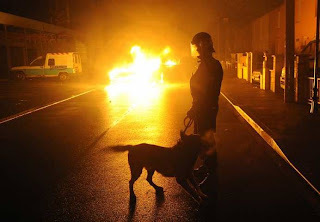 "This resulted in further clashes with police officers and locals, some of whom fired weapons into the air as the tension continued to escalate. Sporadic acts of vandalism continued and schools remained closed." 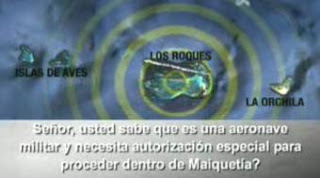 FEARS of an American attack on Venezuela have been raised by an incursion into its airspace by a US military jet. The Spanish paper El Pais reports today that Venezuelan TV has broadcast a conversation, in English, between the pilot and the control tower at Maiquetía international airport. The pilot says he has flown from Curazao which, like Aruba, is a Dutch-owned island off the coast of Venezuela. Venezuela's anti-US leader Hugo Chavez has warned that the US would use Colombia, Aruba and Curazao as "platforms" from which to attack his country. 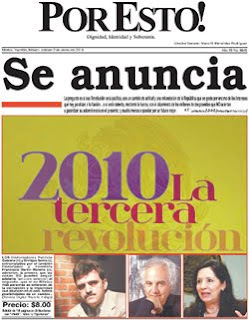 MEXICO is on the brink of its third revolution as it enters 2010, according to a widely circulated New Year message from a leading journalist. "Or if it will be violent, through force, with the uprising of millions of destitute people who can’t manage to guarantee their survival in the present, much less bet on a brighter future." The opinion piece by Garza, director of Reporte Indigo, was republished January 2 on the cover of the daily Por Esto!, the third most read newspaper in the Republic of Mexico, and put online by Narco News. Said the New York Times: "Peruvian officials say a riot by about 500 inmates at a northern prison killed two inmates and six guards were held hostage until negotiations got the prisoners to end their protest. "Chief Cabinet minister Javier Velasquez says the violence erupted on New Year's Eve in the prison in Chachapoyas, about 650 kilometers (400 miles) northeast of Lima. "Velasquez says he's not sure what caused the riot, but local Television N says inmates want a change in prison management because of a crackdown on drugs and cell phones. "The rioters met with high-level officials Friday, then freed the five male and one female guards taken hostage." Authorities are not revealing what concessions were made to the rebel inmates. 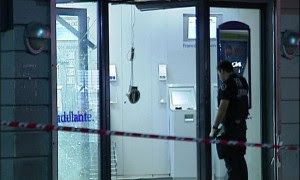 ANARCHIST insurgents have launched bomb attacks on banks in both Argentina and Mexico. A statment from the Revolutionary Cells (Salvador Puig Antich Brigade) on Ai Ferri Corti said: "In solidarity with the international hunger strike being carried out by anarchist comrades, we used a medium-powered homemade device to attack a Banco Francés branch on the corner of Calle Corrientes and Calle Uruguay in downtown Buenos Aires. "In this way we show the vulnerability of spaces controlled by capital, and the uselessness of its faithful servants. "We salute all those who struggle every day against this system of misery and hunger, and we call on them to not lower their guard and to continue the campaign of offensives against the state and capital." And a communiqué from the Animal Liberation Front/Earth Liberation Front in Mexico said: "At around 3 a.m. on December 24, we left an explosive device stuffed with dynamite at the BBVA bank branch in Ecatepec, Mexico State. At the same time, we left another one of our gifts in front of of the Kenworth company, which was being guarded by two state police patrols. Both targets suffered damage to their windows. "We undertook this action on the same avenue (José López Portillo) where, a few weeks ago, the 'Unforgettable Vengeance Eco-Sabotage Brigade' detonated a gas canister bomb at a Banamex in Coacalco. "The authorities didn’t imagine that other groups would again attack the same 'controlled perimeter,' and they left such targets vulnerable and ready for our packages of dynamite. "The destruction of their social peace was inevitable when the fuse was lit and the device activated. The loud explosions echoed in the ears of those who sustain power and authoritarianism, gained at the cost of the destruction of the planet we live on, which in turn is mostly caused by companies like the ones we attacked this morning. "BBVA is a deceitful company that manages money earned from the exploitation of animals, humans, and the Earth. Kenworth is tied to the construction industry and has contacts with businesses like CAT and CARSO, which are directly responsible for environmental devastation."